Gantt Chart is a tracking chart to represent the plans in graphical representation. And Best Chart to represent the Project tasks in visually appealing graphical format. And it is most widely using in Project Management and Planning the Activities. Who made the Gantt chart? Karol Adamiecki is the first person who created Gantt Chart initially. and he is an engineer in Poland and interested in management. However, It is named after Henry Gantt, an American Project manager. Herny Gannt created his most popular and widely using Chart Type in Project Management and Project Planning. It named as Gantt Chart. What is a Gantt chart used for? Gantt charts used for visually representing the Project Schedules. 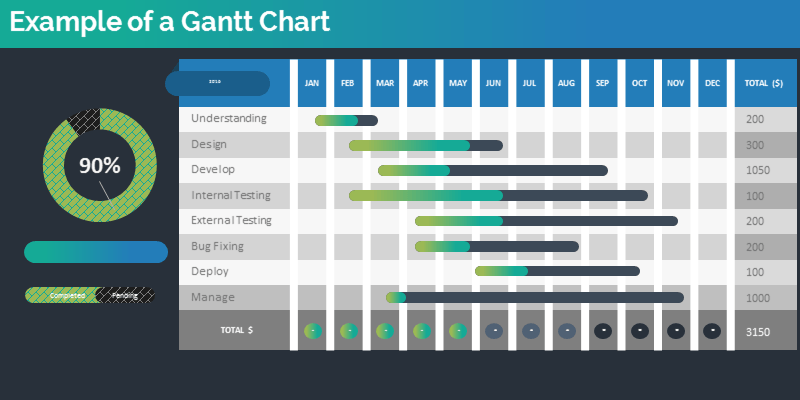 Here is the clear explanation about the Gantt Chart. And we have covered the different elements in the Gantt and its features. A Gantt chart is the Visual representation of the Project Schedules. Also, Project activities are shown in the Stacked Bar Chart to represent Completion Tasks, Tasks In Progress and Tasks Pending. And each stack in the chart is highlighted with a different color to differentiate % of tasks to represent the status. Advanced Gantt Charts will have scroll bars to scroll the items in Charts. And scrollbars helps the user to navigate and display required items on Chart. And we can also show the additional metrics. For example, Project and Milestone separators on the Gantt Charts. And we can also show the overall aggregates by Milestones, Phases and Projects. Similarly, we can add dependencies and predecessors in the Gantt Charts to relate with other tasks. And we can also group all sub task under a main task. And this grouping helps to expand and collapse all sub tasks under a main task. Here is the best example of Gantt Chart. This example Graph helps the manger to understand how much work is completed. And number of tasks in Progress. We can also see the %Progress of each Task. You can clearly understand the Progress of Project by Phase. This Also helps to understand % of work completed, start date and due dates. We can use Shapes or Excel Bar Chart to Make a Gantt charts. Here are the two approaches to create Gantt Graph Format in Excel. 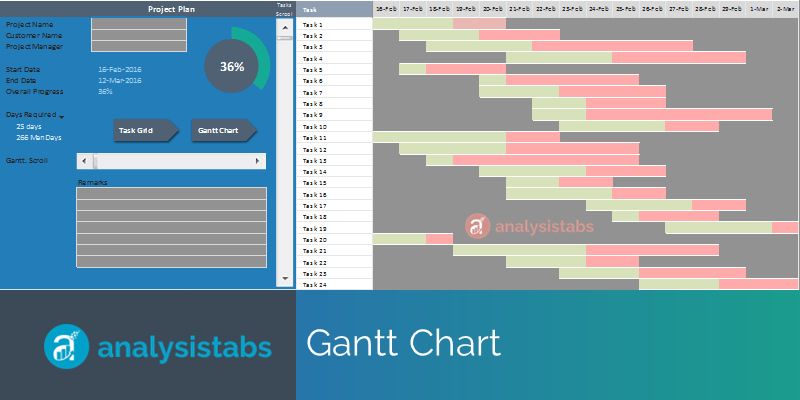 Gantt Using Shapes: This is a manual approach, we can use the Shape Objects Rectangle or a Rectangle with Rounded Corners to Create Gantt Chart. Gantt Using Bar Chart: We use Bar Chart in Excel to create Gantt Type Charts. We can use Start Date as the first Series. And Add the remaining Series to represent % of Work Completed, In Progress and remaining. Here is an Example file with Gantt Chart in Excel Format. You can download the File and Change the required data to represent your plans. This Example Excel Gantt Type chart File works in Excel 2007, 2010,2013, 2016 and Above for Windows. Excel 2011 and 2016 and above for Mac. Here is an Example file with Gantt Chart in MS Word Format. You can download the File and Change the required data to represent your plans. This Example MS Word Gantt Type chart File works in MS Word 2007, 2010,2013, 2016 and Above for Windows. MS Word 2011 and 2016 and above for Mac. Here is an Example file with Gantt in MS PowerPoint Format. You can download the File and Change the required data to represent your plans. This Example MS PowerPoint GanttChart Format File works in MS Word 2007, 2010,2013, 2016 and Above for Windows. MS PowerPoint 2011 and 2016 and above for Mac. Here is an Example file with Gantt Chart in Google Sheets. You can download the File and Change the required data to represent your plans. Here is an Example file with Gantt in Mac Keynote Format. You can download the File and Change the required data to represent your plans. Gantt chart is used for making visual representation of project timelines. It is very useful to monitor the overall project status.